Zachariah isn’t one of the better-known Old Testament prophets, and we don’t often read his book in the Bible, but that doesn’t mean we should ignore it. A reoccurring theme in Zachariah’s writing is a shepherd and his sheep, about bad shepherds and bad flocks. These allusions to a shepherd apply to Zachariah’s audience, looks prophetically into the future, and provides a valuable illustration for us today. The eleventh chapter in Zachariah’s book digs into perplexing references about shepherds and their sheep. It’s about God and his people, about leaders and their charges, and it’s about us. Each of these emerges with a bit of perplexing confusion. Zachariah seems to be talking figuratively, while at the same time personifying God. Zachariah writes, “The flock hates me, and I’m sick and tired of them. I’m done with them. Let them die,” (Zechariah 11:8-9). I wonder, how often do we hate God? Or at least, how often do we act as though we do? I get that. What horrifies me, however, is the thought of God giving up on us and walking away. Yet it’s exactly what he did and is doing in this text with his chosen people. May we never hate God. More importantly, may God never give up on us. Now let’s apply this to today’s congregations and their leaders. Most church members at most churches adore, or at least respect, their leaders. That is their preacher, or more biblically, their shepherd. Yet I’ve seen instances where things go awry, where the church flock—the sheep—despise their leader—their shepherd. Though this is sometimes the fault of the leader, more often, it’s the result of bad sheep who misbehave and don’t follow well. Other times I’ve seen shepherds who’ve given up. They’re burnt out, exhausted, and function in survival mode. This may be their own issue, but I suspect that in most cases it’s a human reaction to how they’re treated by their flock. 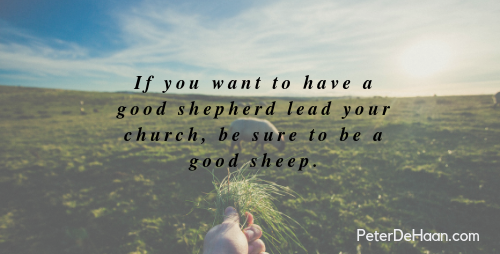 God gives us shepherds to lead, protect, and nurture us. But we need to be good sheep too. We need to speak well of our shepherds, stand up for them, and respect them. If we can’t do that, we’re hurting our shepherd and damaging the flock. If we aren’t careful, we’ll be the cause for the very thing Zachariah writes about in today’s text. Good shepherds and good sheep are part of the solution, not the cause of the problem.